“How can you not be romantic about baseball?” Brad Pitt, playing longtime Oakland A’s general manager Billy Beane, asks that at the end of Moneyball—and I have a mentor who likes to remind me of it. In fact, most any problem I have, moments of self doubt, questions about strategy or direction, etc. are usually answered in one of two ways: 1) Jenny, what do you think, or 2) with a sports metaphor—and Beane’s quote is a favorite . . . for good reason. Stay with me. Willie Mays is the Say-Hey Kid, Jackie Robinson broke the race barrier, and Joe DiMaggio is forever memorialized in a Simon & Garfunkel song. These baseball greats are known by millions around the globe and their legacies are enshrined in the National Baseball Hall of Fame. They made history and established baseball as America’s favorite pastime. But what about Tim Berners-Lee, Margaret Hamilton, or Ivan Sutherland? Heard of them? Berners-Lee paved the way to the internet, Hamilton landed astronauts safely on the moon for the first time, and Sutherland set graphics in motion with computer-aided design. Their names are relatively unknown to people outside of science, technology, and computing, yet they’ve transformed our world and beyond unlike any other group in any other era. Because of this, their stories are preserved and celebrated in the Computer History Museum’s Hall of Fellows. Berners-Lee, Hamilton, and Sutherland didn’t just hit homeruns. They redefined history with their remarkable accomplishments and established the world’s greatest pastime. Now, how can you not be romantic about that? Left to right: Dov Frohman-Bentchkowsky, Dame Stephanie Shirley CH, and Guido van Rossum will be inducted into the Museum’s Hall of Fellows on April 28, 2018. For over three decades, the Fellow Awards at the Computer History Museum (CHM) have honored distinguished technology pioneers for their outstanding merits and significant contributions to the advancement of computer history and the evolution of the Information Age. In line with the Museum’s overarching vision to explore the computing revolution and its impact on the human experience, the Fellow Awards are an ongoing initiative and supported by collecting, education, research, and media efforts that reflect the seminal work of each Fellow. Each year, as a result of a public nomination process that is overseen and evaluated by an expert committee, a new class of Fellows is chosen and honored during a gala ceremony. Tomorrow, Saturday, April 28, the Museum will induct three new honorees: Dov Frohman-Bentchkowsky, Dame Stephanie Shirley CH, and Guido van Rossum. Their personal journeys are inspiring and the impact of their contributions to computing has advanced humankind. Fellow Awards programs from the CHM institutional archive, 1999, 2001, and 2003. The Fellow Awards are a Museum-wide effort. Every detail is scrutinized to make sure the evening is a success, including program and invitation design. Dov Frohman-Bentchkowsky, while working as an engineer at Intel in the early 1970s, invented the first commercial erasable programmable read-only memory (EPROM), a memory device that enabled programmers to quickly update and test code. Gordon Moore called the invention “as important in the development of the microcomputer industry as the microprocessor itself.” In the 1960s, Dame Stephanie Shirley recognized both a lack of professional opportunities for women caring for families and an underrepresentation of women in the computing industry. In 1962 Shirley founded Freelance Programmers, a UK company that trained and offered women who had left the workforce gainful employment as programmers. By 1975, the company employed 300 programmers—297 of them women. Guido van Rossum changed the foundation of software development with his 1991 creation of Python, a programming language that composes applications that extend from machine learning to banking to social media and is used by company giants like Microsoft, Google, and Facebook. Frohman-Bentchkowsky, Shirley, and Van Rossum join the ranks of past Museum Fellows, including Apple cofounder Steve Wozniak, ENIAC programmer Jean Bartik, Pixar cofounder Ed Catmull, and early social media pioneer Lee Felsenstein—thank them for your MacBook, smartphones, Toy Story, and Facebook. Continuous work by our curatorial, collections, and media teams goes toward creating and maintaining a substantial archive of our Fellows that includes oral histories, artifacts, and documents. 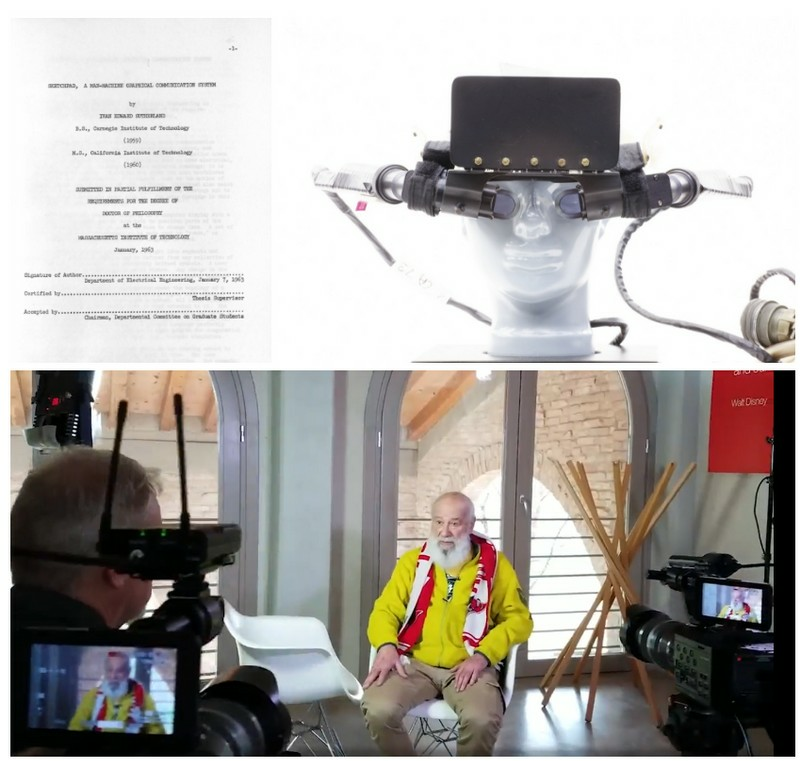 Top to bottom, left to right: cover page from the 1963 PhD dissertation of 2005 Fellow Ivan Sutherland detailing his Sketchpad system; 1968 head-mounted display, which gave its wearer the illusion of a 3-D scene, by Ivan Sutherland; and Dov Frohman-Bentchkowsky being interviewed by Media Director Jon Plutte in Treviso, Italy, on February 2, 2018. Collection of the Computer History Museum, 102726907, X1044.90, and 102738721. The Fellow Awards were started in 1987 by Gwen Bell, cofounder of Boston’s The Computer Museum (TCM), precursor to CHM. TCM named Admiral Grace Murray Hopper as its first Fellow for her essential role in developing programming languages and standardization efforts. 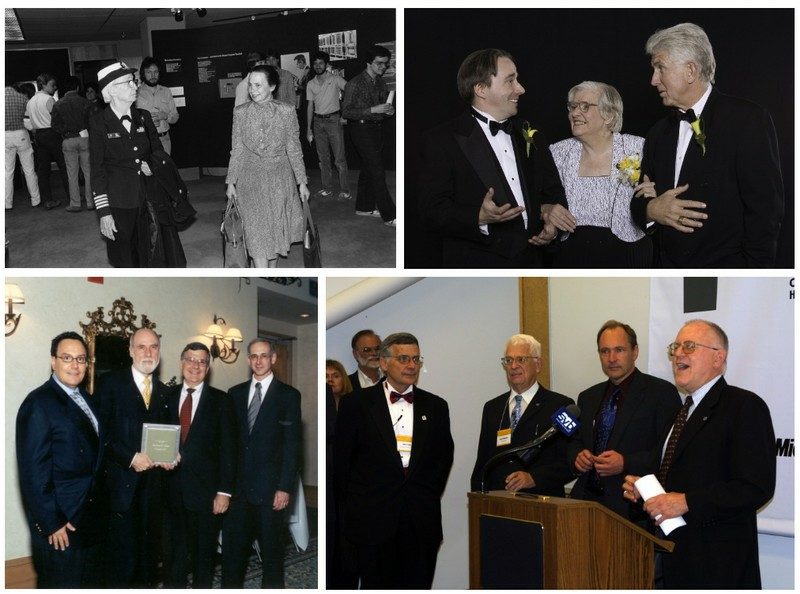 Top to bottom, left to right: 1987 Fellow Grace Hopper and Gwen Bell at The Computer Museum; 2008 Fellows Linus Torvalds, Jean Bartik, and Bob Metcalfe; former board member Peter Hirshberg, 2000 Fellow Vint Cerf, former Museum CEO John Toole, and Board Chairman Len Shustek; and Toole with 2003 Fellows David Wheeler, Tim Berners-Lee, and Gordon Bell. Hopper’s mix of gumption and technical prowess embody the spirit of the Fellow Awards. It’s funny, I often find myself in conversations about the relevancy of computer history. I understand basic hypertext tags, was only recently taught to count in binary (thank you, Dag Spicer), and my go-to fix for any technology is to restart and pray. That may be the extent of my technical knowledge. But, what I do know, what I do understand, is that embedded within each device we carry around in our pockets is an unbreakable spirit and a fearless imagination of men, women, and teams whose creativity, persistence, and vision have transformed computing—and, in turn, changed the world. Encoded in each object is their story, a bit of computer history—our legacy. That’s what our Fellow Awards are all about. How’s that for relevant? Yankee Stadium is known as the Cathedral of Baseball. Its 90-year history, throughout various reconstructions, has seen the likes of Babe Ruth, Mickey Mantle, and Derek Jeter. It stands as a symbol for all that is good and great about baseball, encapsulating the spirit of players and fans who witnessed magic—history—inside its walls. It is the pinnacle of dreams. And no one person built it. It was built by anyone and everyone who has ever touched a baseball or watched a game. Many people think they built the cathedral we call technology. But in reality, we are each just adding our own brick to the edifice. Like baseball, computing and technology are what they are because of the people—the users and makers, dream seekers and problem solvers—those who have come before us and those who are yet to come. The Museum’s Fellows are the foundation of the greatest cathedral on earth. In short, they hit it out of the park. The 2018 Fellow Awards are made possible by Headline Sponsor Accenture; Fellow Sponsors Dropbox and Intel; and Gala Sponsors 1185, First Tech Federal Credit Union, Intuit, TidalScale, and UBS. Jennifer De La Cruz is director of brand and marketing communications at the Computer History Museum. Jenny joined the Museum in September of 2011 and is responsible for writing, editing, and project managing online and printed materials that support the Museum's communications, interpretation, and overall marketing strategy. She has worked at the San Francisco Museum of Modern Art and the San Jose Museum of Art. Jenny holds bachelor's degrees in art history and English from the University of California, Santa Barbara and a master’s degree in art history from San José State University. She is a regular contributor to Hi-Fructose magazine.